TO VIEW MORE TRUCKS,? DETAILED INFORMATION,? **** ADDITIONAL PICTURES ****,? 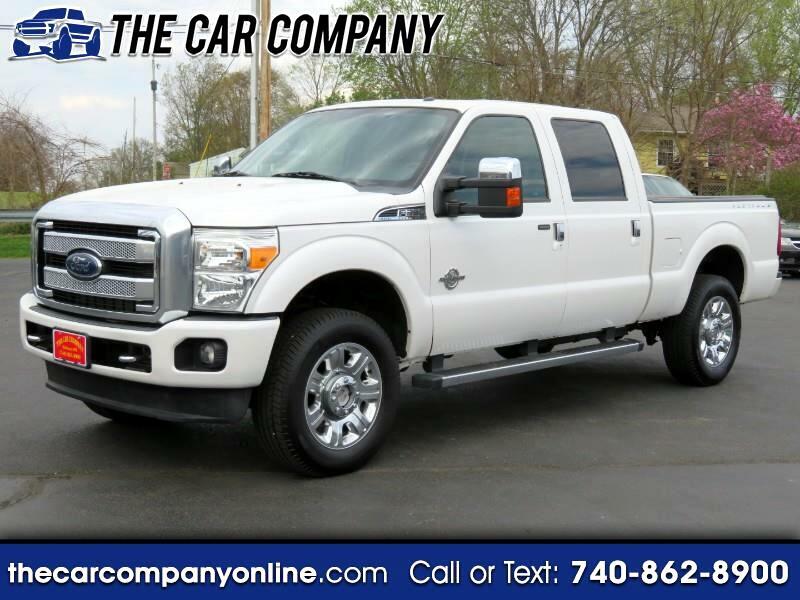 AND A FREE CARFAX REPORT PLEASE VISIT OUR WEBSITE @ WWW.THECARCOMPANYONLINE.COM CENTRAL OHIO'S DIESEL TRUCK STORE!!! CELEBRATING 35 YEARS IN BUSINESS A+ RATED BY THE BBB NO GAMES,? NO GIMMICKS ASK TO SEE THE CARFAX REPORT! BEAUTIFUL PLATINUM POWERSTROKE DIESEL!!!! 2013 FORD F-350 PLATINUM 4X4 6.7L POWERSTROKE DIESEL AUTO LOADED LEATHER HEATED AND COOLED SEATS POWER SEATS MEMORY DRIVER SEAT ADJUSTABLE FOOT PEDALS STEERING WHEEL CONTROLS HEATED STEERING WHEEL TILT CRUISE NAVIGATION BLUETOOTH BACK UP CAMERA SUNROOF AUTOMATIC DUAL ZONE CLIMATE CONTROL FACTORY BRAKE CONTROLLER UPFITTER SWITCHES 20IN WHEELS FOG LIGHTS RUNNING BOARDS TOW MIRRORS RUST FREE TEXAS TRUCK!!!! CALL US @ 740-862-8900 OR 1-888-273-4169Additional InformationPickup Bed Light,? Pickup Bed Type - Fleetside,? Tailgate - Removable,? Door Handle Color - Body-Color With Chrome Accents,? Front Bumper Color - Body-Color,? Grille Color - Chrome,? Grille Color - Chrome Surround,? Mirror Color - Chrome,? Rear Bumper Color - Body-Color,? Armrests - Rear Center Folding With Storage,? Dash Trim - Simulated Wood,? Door Trim - Simulated Wood,? Floor Mat Material - Carpet,? Floor Material - Carpet,? Floor Mats - Front,? Floor Mats - Rear,? Front Air Conditioning - Automatic Climate Control,? Front Air Conditioning Zones - Dual,? Heated Steering Wheel,? Steering Wheel Trim - Leather,? Steering Wheel Trim - Wood,? Adjustable Pedals - Power,? Center Console - Front Console With Armrest And Storage,? Cruise Control,? Cupholders - Front,? Dimming Rearview Mirror - Auto,? Easy Entry - Power Driver Seat,? Keypad Entry,? Memorized Settings - 2 Driver,? Memorized Settings - Adjustable Pedals,? Memorized Settings - Driver Seat,? Memorized Settings - Passenger Seat,? Memorized Settings - Side Mirrors,? Multi-Function Remote - Keyless Entry,? One-Touch Windows - 2,? Overhead Console - Front,? Power Outlet(S) - 115v Rear,? Power Outlet(S) - 12v And 115v Front,? Power Outlet(S) - 12v Rear,? Power Steering,? Reading Lights - Front,? Retained Accessory Power,? Steering Wheel - Tilt And Telescopic,? Steering Wheel Mounted Controls - Cruise Control,? Steering Wheel Mounted Controls - Multi-Function,? Steering Wheel Mounted Controls - Phone,? Storage - Cargo Tie-Down Anchors And Hooks,? Storage - Door Pockets,? Storage - In Dash,? Storage - Sunglasses Holder,? Storage - Under Front Seats,? Storage - Under Rear Seats,? 4wd Selector - Electronic Hi-Lo,? Front Brake Type - Ventilated Disc,? Front Shock Type - Gas,? Front Spring Type - Coil,? Hill Holder Control,? Rear Brake Type - Ventilated Disc,? Rear Shock Type - Gas,? Rear Spring Type - Leaf,? Trailer Stability Control,? 4wd Type - Part Time,? Abs - 4-Wheel,? Axle Ratio - 3.73,? Electronic Brakeforce Distribution,? Front Brake Diameter - 14.29,? Front Suspension Classification - Solid Live Axle,? Front Suspension Type - Multi-Link,? Rear Brake Diameter - 14.3,? Rear Suspension Classification - Solid Live Axle,? Rear Suspension Type - Multi-Leaf,? Roll Stability Control,? Stability Control,? Traction Control,? Alternator - 200 Amps,? Battery Rating - 650 Cca,? Engine Hour Meter,? Gauge - Tachometer,? In-Dash Cd - Mp3 Playback,? Infotainment - Sync,? Navigation System - Hard Drive,? Navigation System - Voice Operated,? Radio - Voice Operated,? Total Speakers - 9,? Video System - Auxiliary Audio/Video Input,? Warnings And Reminders - Tire Fill Alert,? Wireless Data Link - Bluetooth,? Antenna Type - Mast,? Auxiliary Audio Input - Bluetooth,? Auxiliary Audio Input - Jack,? Auxiliary Audio Input - Memory Card Slot,? Auxiliary Audio Input - Usb,? Compass,? Electronic Messaging Assistance - With Read Function,? In-Dash Cd - Single Disc,? Multi-Function Display,? Multi-Functional Information Center,? Phone - Pre-Wired For Phone,? Premium Brand - Sony,? Radio - Am/Fm,? Radio - Hd Radio,? Radio - Touch Screen Display,? Subwoofer - 1,? Trip Computer,? Warnings And Reminders - Low Fuel Level,? Warnings And Reminders - Low Oil Level,? Headlights - Auto Delay Off,? Headlights - Auto On,? Spare Tire Mount Location - Underbody,? Spare Tire Size - Full-Size Matching,? Spare Wheel Type - Steel,? Tire Type - All Season,? Wheels - Polished Aluminum,? Tire Pressure Monitoring System,? Pickup Sliding Rear Window - Power Horizontal,? Window Defogger - Rear,? Front Wipers - Intermittent,? Power Windows,? Rear Privacy Glass,? 2-Stage Unlocking Doors,? Anti-Theft System - Alarm With Remote,? Body Side Reinforcements - Side Impact Door Beams,? Camera System - Rearview,? Child Safety Door Locks,? Child Seat Anchors - Latch System,? Front Airbags - Dual,? Impact Sensor - Post-Collision Safety System,? Parking Sensors - Rear,? Power Door Locks,? Programmable Safety Key,? Rearview Monitor - In Dash,? Side Airbags - Front,? Side Curtain Airbags - Front,? Side Mirror Adjustments - Power,? Side Mirror Adjustments - Power Folding,?